I am using both Core and Lifter made out of P20 with the same hardness and then there are brass holders in the Core plate to support the lifters. The lifters are supported by T holders at the bottom to slide in ejector plate and locked by allen screws. I really need some elaboration on this and a precise suggestion on what should be done to resolve the issue? The fact that you are using P20 for your lifters and pockets leave few options for a good resolution. There are 3 basic reasons for your problem. Bending/Twisting of your Lifters during ejection cycle. Since I don't know the size of your lifters I can only think that they are not strong enough to withstand the forces being put on them and as previously mentioned, you must have a hardness delta between 2 moving parts to avoid gauling----a hardcoat finish on your lifter might help---but only for a limited time---so I would suggest going to a new set of H13 Lifters that are heat treated to a greater hardness than your P20 blocks. Another option that may resolve the problem is to enlarge the lifter pockets so that Bronze plates can be installed and have a favorable effect regarding gauling. 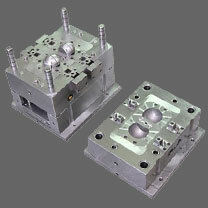 Sir, we have manufactured a injection molding of single cavity with 20 lifters which are ceased during trial out time but there is no scoring in between lifter and core as well as with guiding blocks. In fact lifter runs without any problem during dry run but at trial out time lifters are ceased. Size of lifter rod is 12X8mm and material of core and lifter is p20 with same hardness. Please suggested me proper way for this problem.